Echocardiography is ultrasound... of the heart. The technique uses ultrasound. The principle involves recording the electrical potentials which control cardiac activity using an instrument which amplifies the signals. These are then re-transcribed and analysed. The examination is performed by a cardiologist either in a hospital or in specialist consulting rooms. 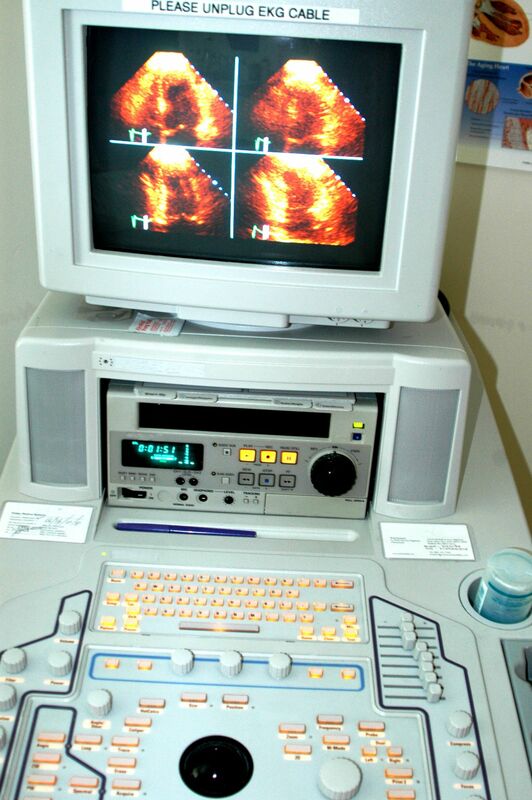 Echocardiography reproduces an image of the heart and the great vessels. It is therefore used to examine cardiac dynamics and the thickness of the walls of the heart. It also provides information about the presence of any areas of ischaemia in infarction. It can be used to demonstrate a malformation or a tumour. TM mode (Time Motion) enables echocardiography to study the movements of the cardiac walls and valves. On the other hand, two-dimensional echocardiography studies the morphology and kinetics of the heart valves and the various features of the heart as it functions. The patient is naked to the waist and lies on his/her back. The cardiologist may ask the patient to turn onto his/her left side in order to improve image quality. The cardiologist will then apply a gel to the skin which promotes transmission of the ultrasound. The investigation lasts 10 to 30 minutes during which the cardiologist records images and takes measurements. These are the same as for any other ultrasound. In other words it carries no risks. Ultrasound has no side effects or contraindications. It does not use X-rays and therefore is not irradiating.